Squirrel is distressed; she seems to be too late for collecting autumn fruits for the winter. 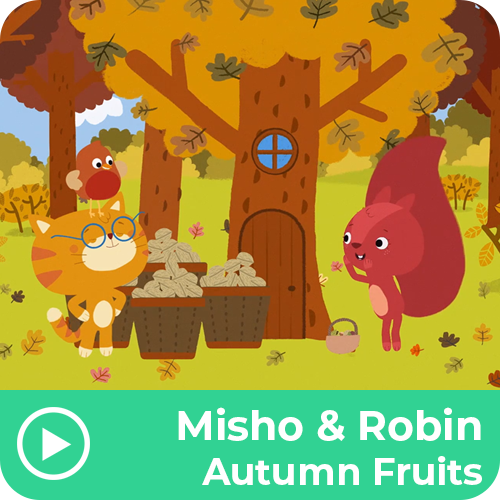 Misho and Robin offer their help, but first they have to learn what the autumn fruits are. They find out about acorns, walnuts, hazelnuts and chestnuts and they’re ready for the search. After a rocky start where a hedgehog is mistaken for a chestnut, Misho discovers a walnut tree. Squirrel is thrilled and very, very grateful. Mission accomplished!